Parry liked to look at the world from upside down, or maybe it was the awful jerry-rigged cage. I called the parrot we caught Parry. I know, not very original. Parry loved people! He must have had a dedicated and loving previous owner. He liked talking to women and would crawl around his cage to stay right in front of them. No one called about having lost a parrot however. In talking about the parrot we found Nancy whose parrot had recently died. 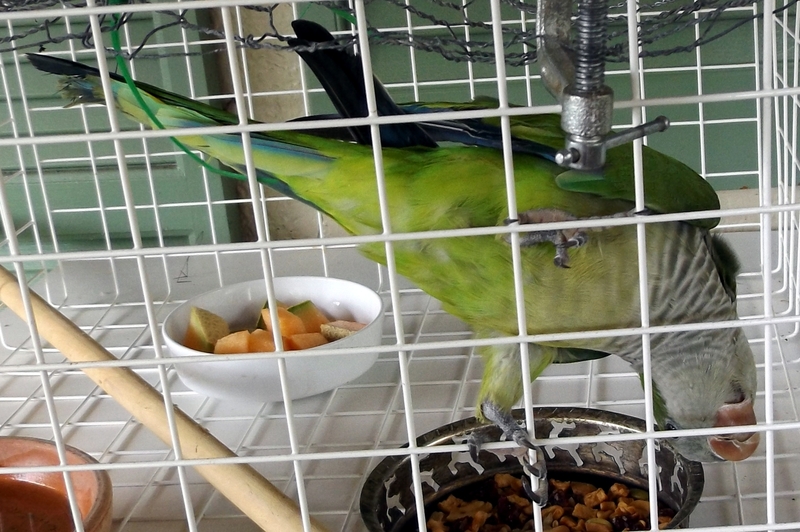 It was a different type from Parry who was a Pilgrim Parrot or Monk Parakeet. Her parrot had been with her for decades and I think she still mourned it. She still had it’s cage and reluctantly came to see Parry when we offered him to her. I think he charmed her because she did take him home. I’m sure Nancy will provide a much better home than I could although I’d already begun to love the little guy. She knows what to do with a parrot, how to take care of Parry, and didn’t own eight cats. I think it was meant to be.